Oh, there is so much to be said about A.A. Milne’s classic stories about the beloved Winnie-the-Pooh. Such a wonderful, funny, happy book. 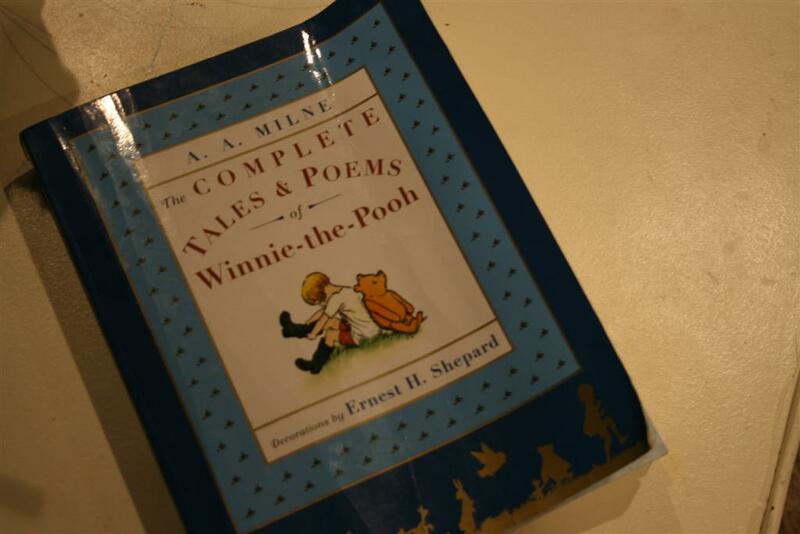 There are a lot of things I love about these stories, and several poems that are fabulous (Now We Are Six being my favorite), but what I want to focus on is Chapter Six: In Which Eeyore Has A Birthday And Gets Two Presents. You see, Piglet came to my rescue today, and EVERY parent of young children should know that Piglet can come to their rescue, too. Someone popped my three year old son’s balloon. There were tears. Many tears. But not for long, thanks to Chapter six. Many years ago when I read these stories to my children for the first time, we read this chapter and laughed until we cried. From that time forward, a popped balloon has always merited a re-telling and a re-reading of this chapter. So that’s what we did today. The chapter begins with Pooh, who finds out that it is Eeyore’s birthday. Pooh leaves in a hurry to go find a present for Eeyore so his day can be a happy one. Pooh arrives at his house and finds Piglet there (Pooh does a funny thing here, but that’s not the story I’m trying to tell you) and tells Piglet about Eeyore’s big day. Piglet remembers that he has a balloon left over from his own birthday and runs to get it to give as his gift. Pooh then goes to Owl, who attempts to write “Happy Birthday” but instead writes something that makes us all laugh when we try to sound it out. 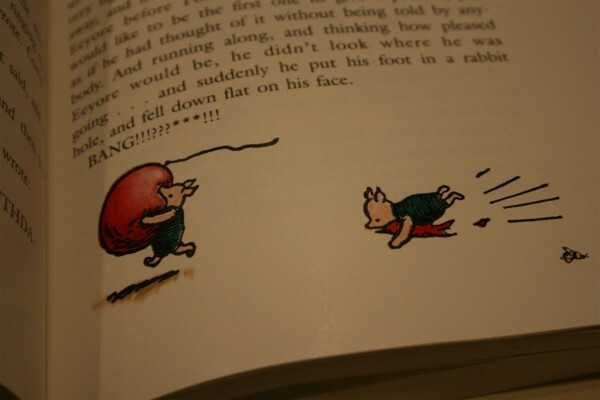 Piglet gets his balloon and is running along to find Eeyore when he steps in a rabbit hole and falls down flat on his face with a big BANG! “He was still in the Forest! Well, as you can guess, the “damp rag” is what’s left of the big, beautiful balloon. Let me assure you, every child knows what those damp rags look like but A.A. Milne found words for it all. At this point in the story we are always laughing. 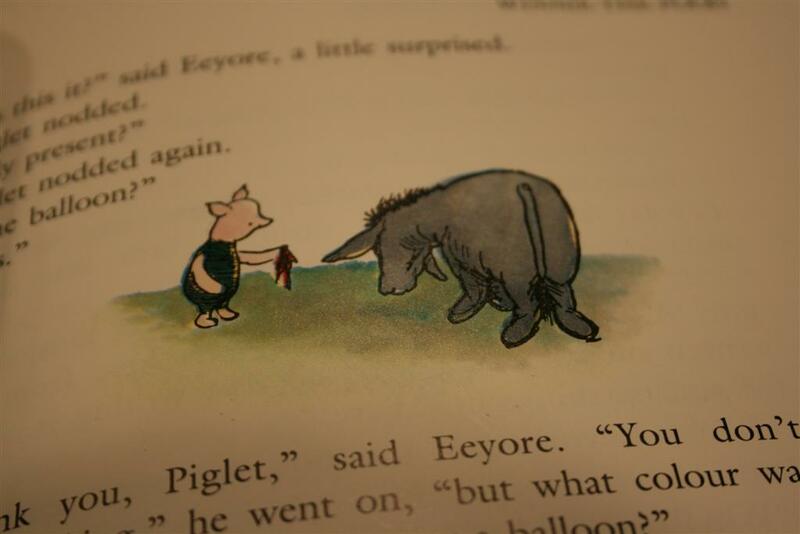 Piglet decides to go ahead and take what is left of the balloon to Eeyore as his gift. It is so funny to hear Eeyore ask questions about his gift like, “What color was my balloon when it was a balloon?” Sooo funny. Ultimately Piglet’s mishap pairs well with Pooh’s mishap and Eeyore has a very happy birthday, delighted with his gifts. Every list of classic books for children will have this book on it, and for good reason. I just thought I’d let you know that one of the best side effects of reading it will be a lifelong cure for the tears that follow a popped balloon. Totally worth reading for that reason alone! With just a little bit of animated re-telling, you can even get them happy about finding the damp rag. Which is what we did today. Thanks, Piglet!